Scan the QR-code to install the free mobile app and see whatever the cameras see on Android and iOS devices with internet access. Smart and instant motion-activated email alert keeps you in-the-know. Robust 1080N DVR supports up to 1080N (960*1080p) recording. It is compatible with AHD/TVI/CVI/CVBS/IP cameras. Support ONVIF protocol and third party cameras. HDMI and VGA video outputs are available for HD monitor or TV display. Easy installation and configuration system. IP66 weatherproof cameras for indoor and outdoor application. Wide surveillance application: deter intruders, protect families, monitor offices, employees, stores etc. USB backup for peace of mind. CE, FCC and HDMI certified system with UL compliant power adapters. 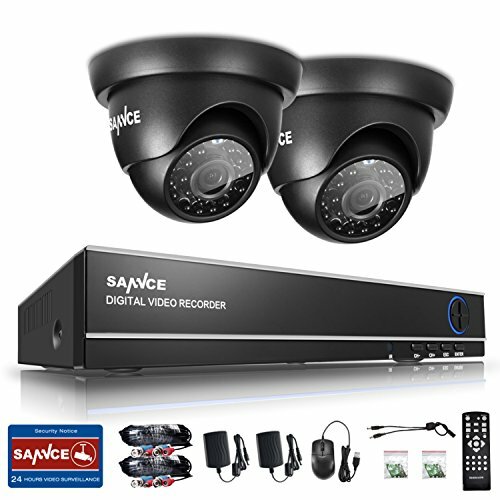 1-year US Warranty and Lifetime professional technical support by SANNCE.